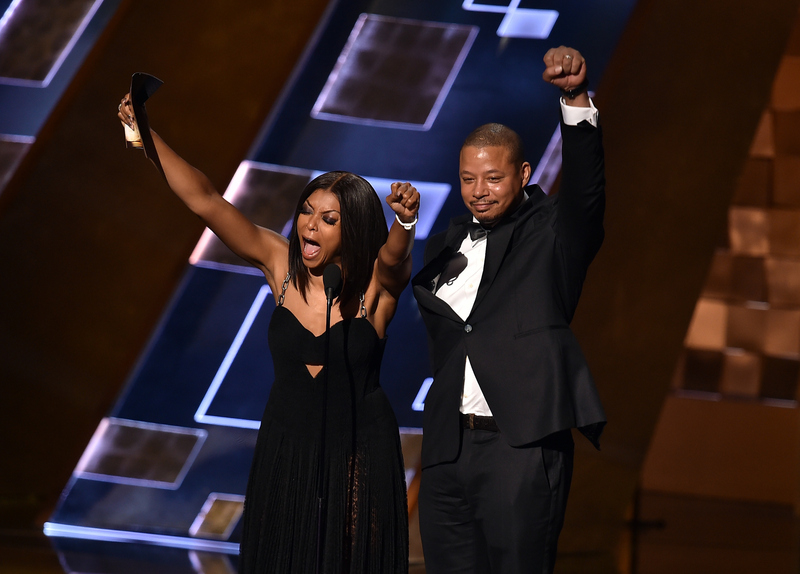 While annually saluting the best in television, Sunday night's Primetime Emmy Awards gave viewers a lot of moments that can be enjoyed over and over again. And I don't mean rewatching the acceptance speeches on YouTube — I mean in GIFs. I've collected the best 2015 Emmy Awards GIFs, because how else will host Andy Samberg's uproarious opening sketch and monologue live on? And I know I can think of at least seven different ways I'll be using Amy Poehler's Outstanding Actress in a Comedy Series hoodie moments as GIFs in the next week — and the rest of the year. She may not have won the Emmy, but Poehler has won internet longevity once again. This year's ceremony has had a lot of goofy, funny moments that are just too perfect for GIFs. Samberg has just been hilarious on Sunday night, killing it with the funny. British comedian Ricky Gervais pretended to cry and accept an Emmy as he was presenting one, telling the audience, "Take a picture. Tweet this." Naturally, the Internet was also going to GIF it, too. And, that moment when comic geniuses Poehler and Amy Schumer — collectively "The Amys" — came together for a historic meeting? That'll live in GIF-infamy forever. All right, it's time to get animated. Here are some of the GIFs from the night. This is the way to be a nominee. She is the queen of the Emmys — Emmy or no Emmy. What's Better Than One Amy? Two! Schumer and Poehler, together at last. The host truly being handled by Scandal star Kerry Washington. This is what he wanted. In the most Jerry/Gary way possible. Sorry, dude. She should seriously win an Emmy for that, too. The final season of The Daily Show deserves it all. Such a well-deserved award for Inside Amy Schumer. She and Ed Asner are the only two actors to win an Emmy in comedy and drama for the same role. What a way to win an Emmy!